As a Zoho Authorized Partner, First Direct has an important role to play for the manufacturer and you, the consumer. That role is comprised of four (4) distinct elements. Only by knowing this can you plan a route and a means to reach your desired objective using Zoho applications. As your solutions partner, it is First Direct’s purpose to help you to reach your business’s aims, your goals & objectives for the use the technology, in the most practical and economic means. Sometimes we also need to help you set more realistic expectations. Help Organizations Market, Sell and Service Better by Deploying and Supporting Award-Winning Technology and Guiding You through the Best Practices for the Solutions We Provide. Generally speaking, software applications are not customized to your exact needs. Working together we can Turn Software into a System by dovetailing Zoho applications to your business’s processes and requirements. When this is achieved, the technology can be used to gain a competitive advantage. 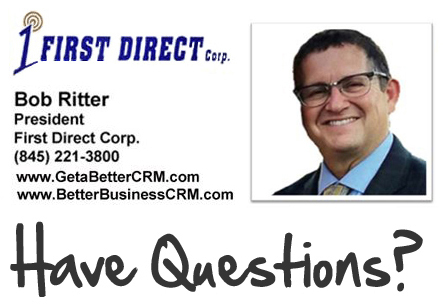 First Direct Corporation has earned numerous awards over two decades as an CRM provider. We’d like to be your CRM partner – and help your organization achieve better results with Zoho products. Speak to First Direct today and let us join you on your journey!